The game retailer is turning quaintly obsolete -- or horrifyingly so, depending on your perspective. Shares of GameStop (NYSE:GME) fell 12.8% in October 2016, according to data from S&P Global Market Intelligence. It was a long, slow dive without dramatic plunges, as investors continued to weigh the true value of a bricks-and-mortar game retailer in an increasingly digital gaming era. 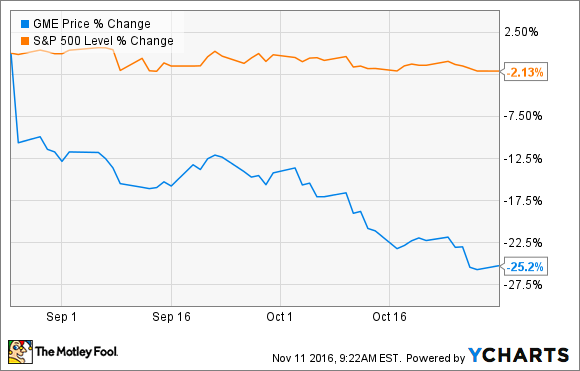 In many ways, October simply continued the crushing downward momentum of GameStop's recent trading history. In August, a disappointing second-quarter report set the lazy avalanche in motion with a quick 11% single-day drop. Nothing has changed since then, except that the desperate nature of GameStop's situation kept sinking in. And the slide didn't stop there. GameStop's November started with another 12.5% crash as the company released a weak slate of preliminary third-quarter results. Comparable-store sales are plunging as much as 7% lower, as October's list of new game titles failed to inspire a customer rush. Both revenue and earnings projections took a large hit, and GameStop keeps moving closer to the edge of irrelevance. The stock is down 53% over the last year at this point. Short of giving up on the physical-retail strategy and becoming an all-digital game distribution hub, I don't know what GameStop's management could do about this terrifying trend. GameStop has burned about $2.5 billion of market value over the last 52 weeks. Don't catch the falling knife, because there's still plenty of value left to destroy. Next up, GameStop will report third-quarter results on Nov. 22. Frankly, I expect another horror show.